Whitworth’s dream start to life in the ChromaSport United Counties League Premier Division got a whole lot better as they made it two wins out of two with a 2-1 success over Deeping Rangers at London Road. 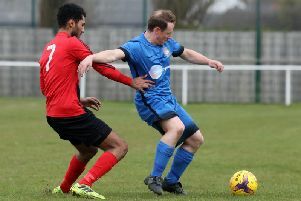 Deeping have been tipped as one of the big title contenders this season but the Flourmen followed up their 5-0 victory at Peterborough Northern Star with another notable win. They did the damage in the first half as goals from Remy Brittain and Jordan Pendered ensured they maintained their 100 per cent start. Another team with a perfect record after two games are Desborough Town. Ar Tarn are yet to concede a goal in three outings, one in the FA Cup, so far this season and they recorded a second 1-0 win of the week as Jason Turner’s strike in the first minute of the second half sealed victory over Wisbech Town at the Waterworks Field. Wellingborough Town suffered a second defeat in two league outings as they went down 4-1 at Kirby Muxloe, despite Michael Cirelli getting on the scoresheet. Rothwell Corinthians’ first game of the Premier Division season ended in a loss as they were beaten 2-1 at Daventry Town with Lewis O’Dell scoring their goal. The first managerial casualty of the Division One season happened after an incredible scoreline at Latimer Park. Dave Dent resigned as manager of Burton Park Wanderers after they were hammered 15-0 by Harrowby United, for whom Joel Carta and Sam Grouse scored five and four goals respectively. At the other end of the table, it’s been a fine start to the season for Thrapston Town as they made it two wins from two games with an excellent 3-2 victory at Olney Town on Friday night. A Luke Waterhouse hat-trick wasn’t enough for Stewarts & Lloyds as they were beaten 4-3 by Bugbrooke at Occupation Road and Rushden & Higham United slipped to their first defeat of the season, going down 2-0 at Blackstones.